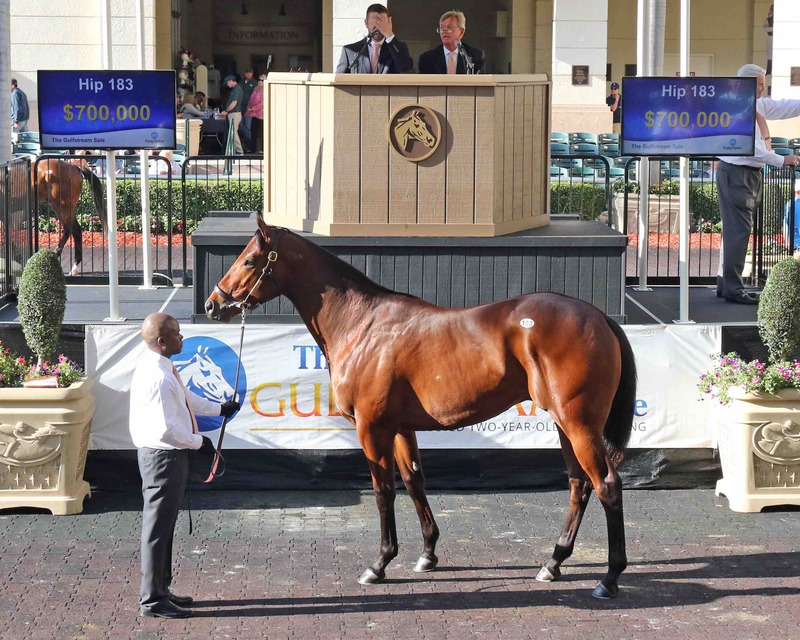 Claiborne stallions Blame and Flatter were represented by several juvenile offspring that fetched notable, six-figure prices at the Fasig-Tipton Gulfstream Sale March 27. A Blame colt out of the Pulpit mare Ascending Angel commanded a final bid of $700,000 from Kerri Radcliffe Bloodstock. Consigned by Randy Bradshaw, agent as Hip No. 183, the colt worked a furlong in :10 flat prior to the sale. He hails from the family of champion and Breeders’ Cup Juvenile Fillies winner Pleasant Stage. Blame, an Eclipse champion and three-time G1 winner, has sired five stakes horses so far in 2019, including graded stakes victors Blamed and Marley’s Freedom. He stands for $30,000 at Claiborne. Two juveniles by Flatter also brought impressive prices. Hip 102, a colt out of the Trippi mare Pretty Miss Trippi, was bought for $350,000 by Timothy Hills, agent for Patrick Welsh. A half-brother to the stakes-placed Graydar filly Aggregator, the Flatter colt was consigned by De Meric Sales, agent. Another Flatter colt out of the Silver Charm mare Deb’s Charm fetched $175,000 from Tom Mansor. Consigned by Kirkwood Stables as, agent for Midway Gallop as Hip No. 18, he is a half- brother to stakes winners Praetereo (by Giant’s Causeway) and Simply Spiteful (by Speightstown). Flatter is the sire of 52 stakes winners and six millionaires. The #1 sire of 2YO stakes winners in 2018 (6), he stands for $40,000 at Claiborne.